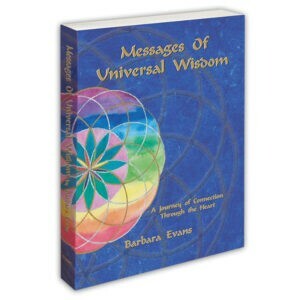 Messages of Universal Wisdom – A Journey of Connection Through the Heart, is a unique and beautifully illustrated account of spiritual awakening and enlightenment, that introduces the reader to Barbara’s high vibrational art (The Image Keys), telling the story of its divinely-inspired creation and significance. This energetically active artwork raises frequency and consciousness, inviting us to create a life we love… a life based on the positive vibrations of Love, Joy, Peace and Hope, rather than the negative vibrations of fear and anxiety. The art, created through infinite love and wisdom, interweaves the multifaceted energies of Sacred Geometry, Crystals, Astrological Alignments, Angels, Sacred Sounds and Spirit Guides. Its purpose is to shine light upon our spiritual path by gently activating our full DNA Blueprint, and the Love and Wisdom we each hold within our heart. This allows us to connect deeply with our true self, our purpose in life, and ultimately our full potential and innate self-healing capabilities. Messages of Universal Wisdom is a rich and inspiring companion for everyone’s spiritual journey of transformation. FW Book of the Year Awards Finalist 2009 …Body, Mind & Spirit. 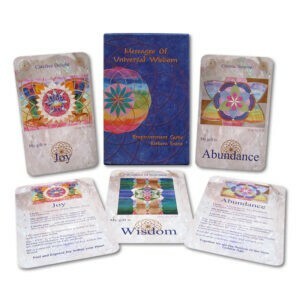 This beautifully boxed set of 42 energetically active cards, proudly published and printed in the USA, has been developed from Barbara’s inspiring high vibrational art (The Image Keys). At the heart of the card deck are visually stunning sacred geometry images imbued with crystal energies and codes of light. They raise frequency and consciousness, and provide unique insights to help awaken us to new possibilities. Allow the Empowerment Cards to inspire your life, as you connect with and manifest the Love, Joy and Wisdom held deep within your Being. They are great fun to play with, and have benefited the spiritual awakening of thousands of people world-wide.